Shown here is the main manor of the W.K. Kellogg estate. The house is now a conference center. 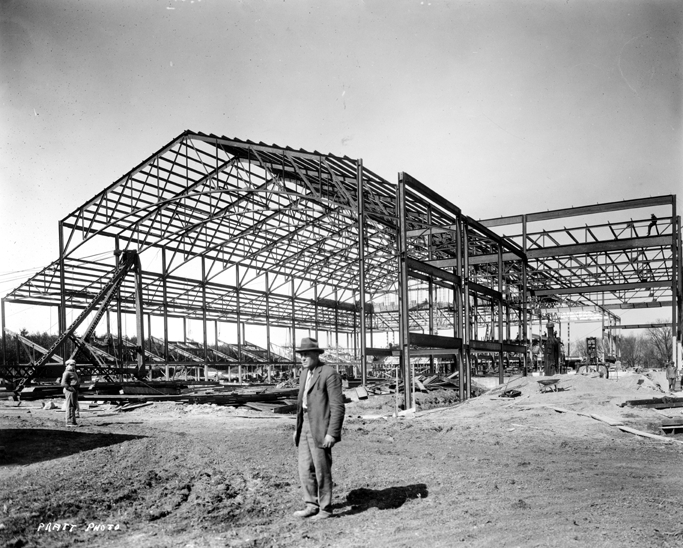 Michigan State University has an extensive history of agricultural excellence, which makes sense for a school that was founded as the Michigan Agricultural College. The men and women of the various horticulture, natural resources, agriculture, entomology, and dairying departments at MSU have long been pioneers in their respective fields and have contributed to today’s practice of agriculture in ways many of us non-farmers cannot even grasp. Currently, MSU has 13 off-campus research facilities spread throughout the state, studying topics ranging across a variety of fields. The W.K. Kellogg Biological Station is one of the oldest of these programs and has been noted as one of the premier institutions of its kind. This particular station is managed by MSU’s College of Agriculture and Natural Resources, and its self-stated research focus is on ecology and evolutionary biology and the applications to sustainable agriculture and conservation. W.K. Kellogg himself was passionate about conservation, and was responsible for the Biological Station’s beginning. 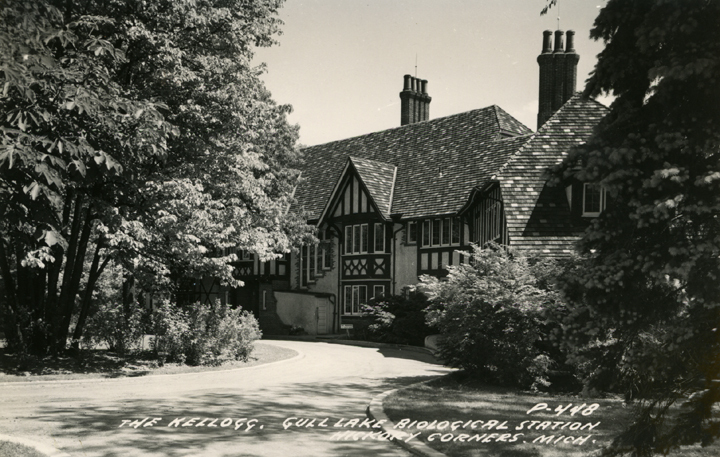 In 1926, Kellogg began the construction of a large manor house on Gull Lake, near Battle Creek. A year after the estate’s completion, he also constructed the site’s first bird sanctuary, which, as researchers would later find out, happened to be at the crossroads of three major bird migration routes. 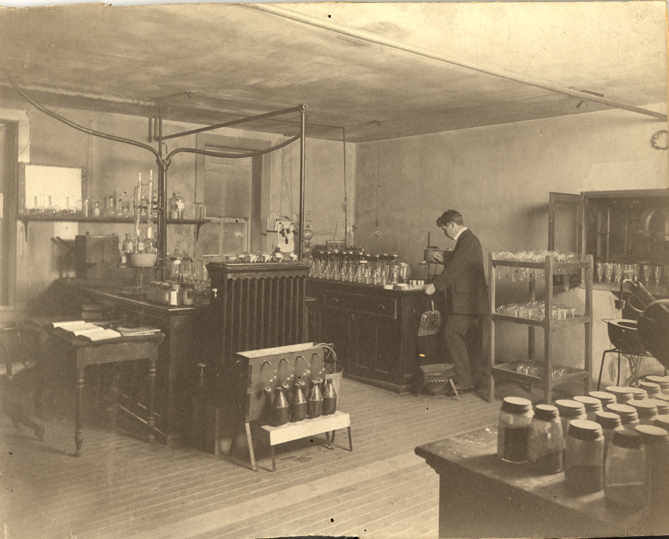 This image shows one of the original classes held at the Kellogg Biological Station. 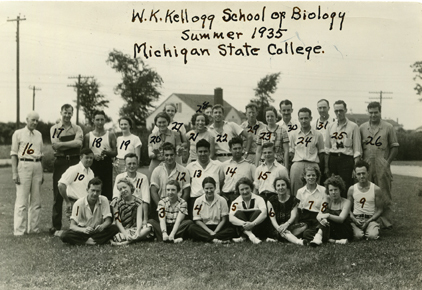 As early as 1930, Kellogg donated an adjoining 1500-acre land tract to MSU for the purpose of research, and so began the first ten years of summer study at the estate under the direction of the School of Biology and Joseph W. Stack from the Zoology department. The property was briefly used as an army rehabilitation hospital for a number of years following, until Kellogg’s death in 1951. At his death, Kellogg bequeathed to MSU the 39-room manor house, guesthouse, 6-car garage, chauffer’s lodgings, and a greenhouse, as well as $45,000 for equipment and remodeling. MSU turned the property into a research station like none other. Today, the area is made up of 4,065 acres of bird sanctuary, farms, biological labs, artificial ponds, a conference center, extension and outreach facilities, and other reserves. This image shows a young man working on fertilizer tests for the Experiment Station. 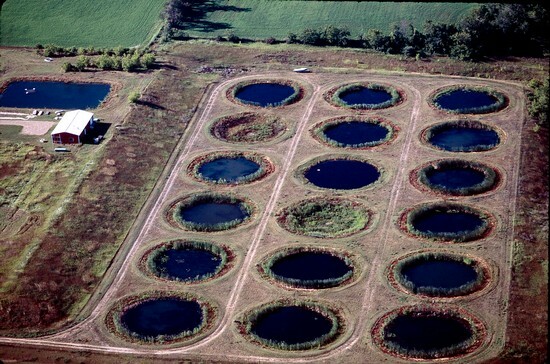 The image above is an aerial view of the 18 artificial lakes built at the Biological Station for research purposes. The Kellogg Biological Station is considered to be so unique because of the ability researchers have to study such diverse and large-scale habitats and systems: wetlands, streams and rivers, lakes, forests and fields, geology and soils, land use and agriculture. The site is useful because of the level of control researchers have; some of the areas range from almost wild forest to heavily managed agriculture, and the geographic area itself is interesting because of its history of glacial activity that formed the tills, plains, and lakes around the grounds. These lakes are another source of academic research of their own, where students can study morphology, water composition, and productivity. The more developed agricultural areas allow for the study of common crops and their sustainability. In fact, the Kellogg Station was the first facility in the US to receive a Leadership in Energy and Environmental Design Silver certification for their work in conservation and sustainability. The Biological Station has been a leader in agricultural education since it opened, publishing hundreds of bulletins concerning every agricultural problem imaginable: fertilizing, infectious diseases, soil types, insects, water quality, farm management… the list goes on and on, and the program shows no signs of slowing down. Today the station has programs for graduate students, undergraduates, kid’s summer camps, internships, research apprenticeships, guest lecturers, and seminars, and the grounds are available for nonacademic purposes as well. Check out their website here for more information. 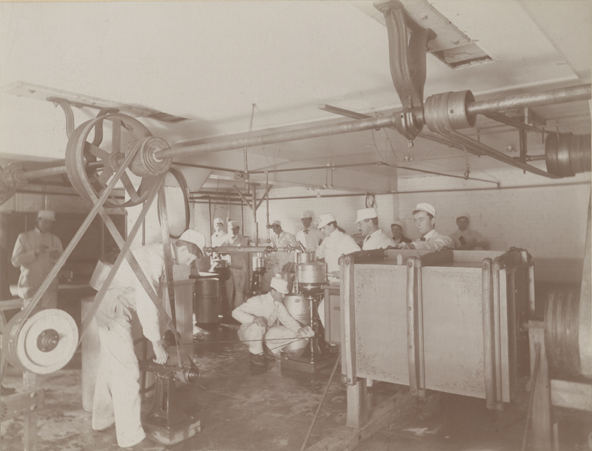 Students in this photograph participate in the first dairy class in 1895. 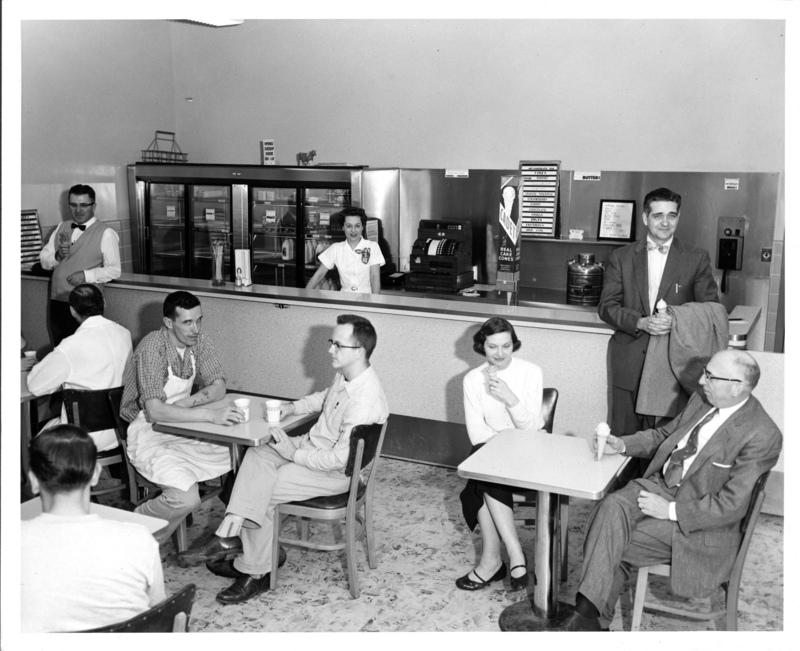 The same Dairy Store we know and love can be seen here shortly after the construction of Anthony Hall. an event we have participated in for a number of years: the Great Dairy Adventure! The Dairy Adventure happens in tandem with the Michigan Dairy Expo, a four-day celebration of all things dairy-related. Hundreds of children came from around the area to the MSU Pavilion for Agriculture and Livestock Education in order to learn about how dairy affects the Michigan economy, the processes which take place to make our dairy products, and the value of such products to our health. There were crafts to make cheese “bugs” and painted cows, as well as multiple farmers to ask questions from and to teach the attendees how to milk a cow. Across the aisle from the Archives’ booth there seemed to be a competition for most popular exhibit, between the free Country Fresh ice cream, yogurt, and chocolate milk, and the cow with the port hole in her side – a harmless plug in the cow’s stomach (rumen compartment), which allowed children and adults to either look in and see the animal’s stomach contents or actually stick a gloved hand in and feel around! Needless to say, we saw some people with mixed feelings about personally infiltrating a cow’s stomach, but the kids were fascinated. 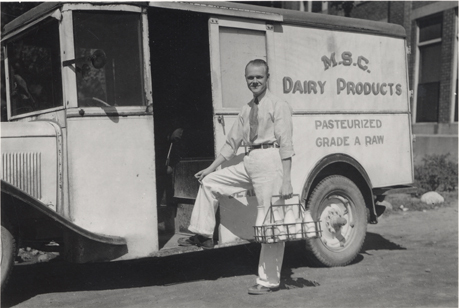 This photograph shows an old Michigan State College milkman posing by his truck. The Archives were there with a couple of entertaining handouts for the children and adults to take home. We offered a variety of free postcards with old MSU scenes, the favorite of which among the kids was probably the greased pig competition from 1948. There was also a pamphlet, “Dairy Adventure Press,” for the visitors to learn about past MSU dairying practices, as well as do some fun dairy-related activities. The mini newsletter had some facts about MSU’s scientific pioneers, Manly Miles, G. Malcolm Trout, and Clinton D. Smith, and it also contained a brief history of the college’s world record cow, Belle Sarcastic. Many of the daycare groups and children’s camps went home with the brochure to do the dairy word search, maze, Belle Sarcastic coloring corner, and create-your-own ice cream advertisement as follow-up activities. The day was without a doubt a success, and hopefully some visitors went home knowing a little bit more about the history and process of dairying! 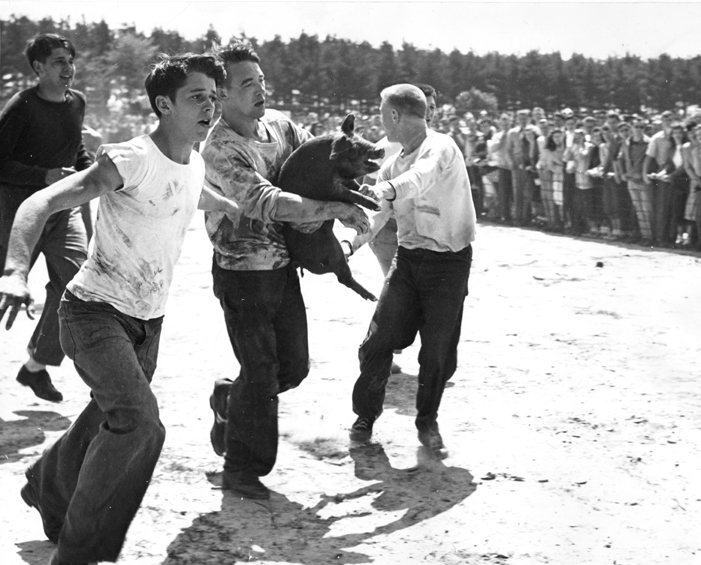 Just for fun, shown here is one of the class rivalry games from 1948, where students have to pass along a greased pig. Every May thousands of new MSU graduates congregate near Circle Drive to take part in what for many is their final MSU tradition – having a photo taken, in full graduation regalia, with MSU’s famous Spartan Statue. Unbeknown to many of the new alumni the backdrop to their photograph is one of the most storied and interesting buildings on MSU’s campus. Demonstration Hall, or Dem Hall as it is affectionately known, was planned by the then Michigan Agricultural College board in 1925 to replace the Campus Armory. Erected in 1928, it was designed to serve as a building “suitable to be used for the demonstration of agricultural stock and implements, for college athletics and the housing of the military department of the college”. 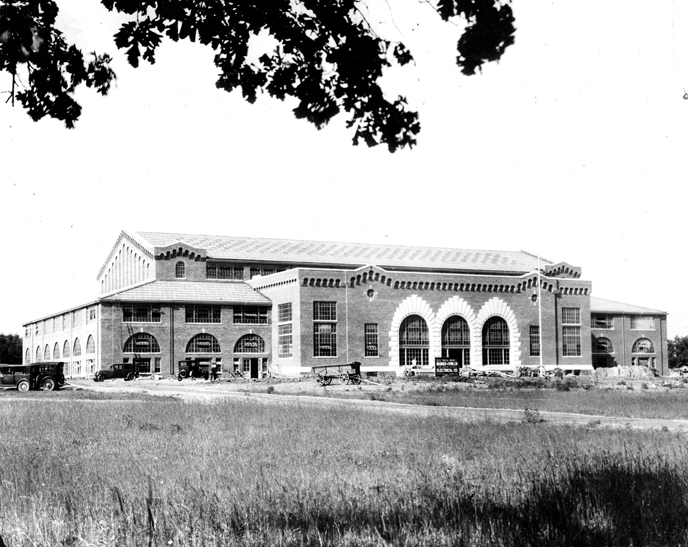 At a cost of $355,000 the Romanesque Revival style building has been one of the most versatile on MSU’s campus and with its impressive arches and vine covered exterior it is still one of the most iconic to stand on the banks of the red cedar. In its early days Dem Hall served many varied purposes for M.S.C. 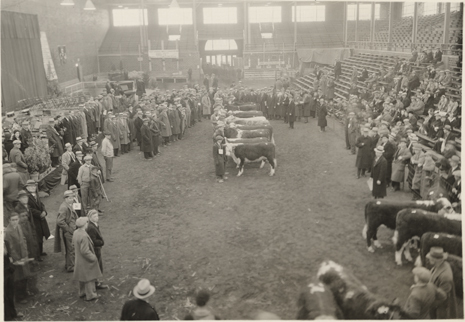 including housing commencement – as seen in this photograph in 1931 – as well as being an arena for agriculture students to show their cows as these students are doing in Farmers’ Week in 1933. 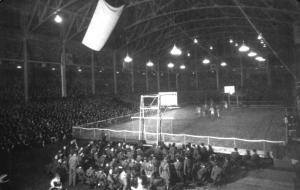 Dem Hall was always a popular sport arena with basketball, soccer, volleyball, and many other sports taken place inside its hallowed walls. 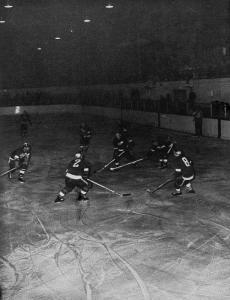 From 1949 Dem Hall was home to MSU Men’s Hockey. 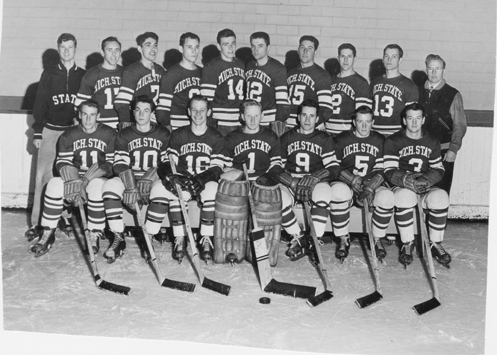 However, this did not prevent MSU from melting the ice in 1951 and using the building as a dormitory to house 650 beds for the Michigan Future Farmers of America and the Michigan Future Homemakers of America; not, it should be pointed out, at the same time….Dem Hall proved to be a happy stomping ground for MSU hockey throughout the ensuing decades and even hosted a game against Gordie Howe’s Detroit Red Wings in 1959 and housed the Spartan team that won its first NCAA Hockey National Title in 1966. Ice Arena in 1974 but Dem Hall’s iconic high ceilings and low lighting still plays host to numerous sporting events such as Intramural indoor soccer and Intramural floor hockey. The arena has also recently become home to the Mitten Mavens, a Lansing/East Lansing flat-track roller Derby team who regularly attract hundreds of spectators to their bouts at the storied venue. Dem Hall has also been used at various times as a gallery for local artists to showcase their goods, as a venue for plays and concerts, and as the location of MSU’s blood-drive. In recent years Dem Hall’s exterior has been renovated with the north facing windows replaced to give a more aesthetic image for the thousands of MSU grads who have it as a backdrop to their Spartan Statue graduation photos and 23 Sienna Glen Maple trees being planted to give the building a more historic feel. Inside the building the smaller hall has been renovated and now serves as a practice venue for the Spartan Marching Band; the acoustics have even been improved so as to replicate the game day sound for the band. The building still houses MSU’s ROTC, although the shooting range has gone, and the budding cadets no longer have to fight for space with cows, sheep, and other livestock! Next time you are near Spartan Stadium or Munn Ice Arena and you pass by a rather dilapidated old-style building or you see a graduate having their photo taken on the Spartan statue with an intimidating but impressive looking arena in the background; stop and take a closer look. 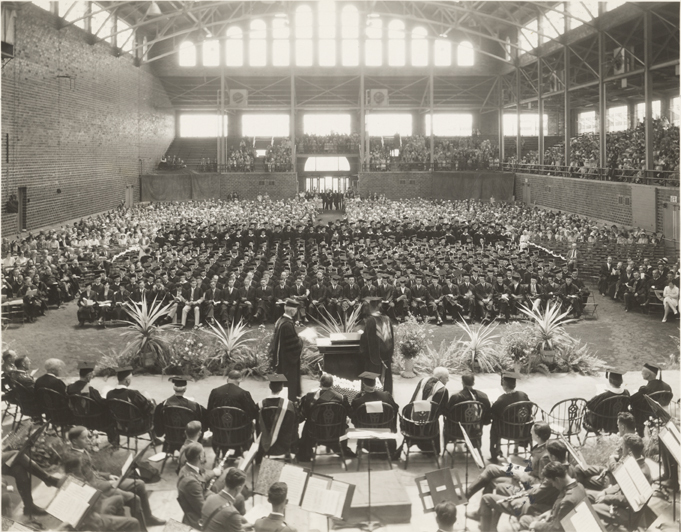 As you do, remember the graduation ceremonies, agricultural shows, ROTC training, Red Wings hockey games, NCAA championships, and many other events that have taken place in one of the most historic venues on MSU’s campus. The University Archives will participate in two events next week that celebrate MSU’s agricultural heritage. Ag Expo is on July 21-23 on the MSU Campus in the area north of Mt. Hope near the intersection with Farm Lane. This year is the 30th anniversary of Ag Expo, which is the state’s largest and longest running outdoor farm show. The MSU Archives will have a booth in the College of Agriculture and Natural Resources (CANR) tent. The theme for CANR is “Family Futures,” so the theme for the archives is “Ensuring Family Futures by Preserving Family Pasts.” Handouts about preserving family history for both children and adults will be available at the booth and archivists will be on hand to consult with people on their preservation and research needs. On Tuesday, July 21, the MSU Archives will be celebrating its 40th anniversary with free cake in the CANR tent. The cake will be served at 1:00pm. For more information you can visit the Ag Expo website. The Great Dairy Adventure will be on Wednesday, July 22 in the MSU Pavilion. Focusing on dairy, the Great Dairy Adventure will allow children to pet different breeds of cows, milk a cow, be a milk mustache celebrity and more. There will also be free dairy treats available. The booth for the MSU Archives will feature facts about the history of dairying at MSU. A handout/coloring sheet featuring Belle Sarcastic, a famous MSU dairy cow, will be free to children. Admission and parking are free for both events. Directions are available on the Ag Expo website. The two activities are located near each other and families could easily visit both in one day. We hope to see you next week!